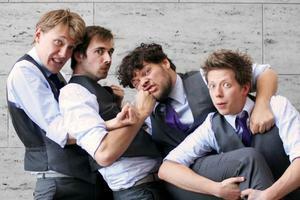 Sunday 30 June: Austentatious improvise a Jane Austen novel at Leicester Square Theatre (7pm, £12.50 / £10). The troupe include Cariad Lloyd and Rachel Parris, and we'll buy a pint on the next pub crawl for anyone who gets this week's £10 note story into the plot. Monday 1 July: Characters and sketches in a double bill of previews at Leicester Square Theatre from Joseph Morpurgo and The Beta Males (7pm, £6 / £5). Tuesday 2 July: Mae Martin headlines a free show at the Camden Head alongside Ellie White and Jamie Demetriou (7.30pm). Expect songs, characters and sketches. Wednesday 3 July: Burger Bear provide the food at Invisible Dot's BBQ Previews, where you get two Edinburgh preview shows and a burger for a tenner. Today's performers are Josh Widdicombe and Luke Wright, which is a sodding bargain (7pm, £10). Thursday 4 July: Ye Olde Rose and Crown in Walthamstow is the venue for Guffaw's week-long comedy festival. Move fast for the remaining tickets to see Tim Vine (8.30pm, £12.50) but other acts appearing include Simon Munnery, Richard Herring and Russell Kane. Friday 5 July: Dan Clark is at the Soho Theatre for three nights (4-6 June): guests confirmed for the whole run include Pappy's, Daniel Simonsen, Brett Goldstein, Oyster Eyes and Ginger & Black, but what we can't do is let you know who's on which night. Sorry (9.30pm, £12.50). Saturday 6 July: Robin Ince tells you about his favourite scientists and some of the weirder theories of early science. We've never seen this guy live without wanting to read more widely. We invariably fail, but the inspiration's there at the Udderbelly if you want it (7.45pm, £15.50).